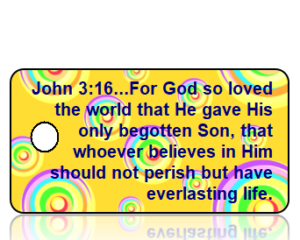 John 3:16 (NIV) - For God so loved the world that He gave His only begotten Son, that whoever believes in Him should not perish but have everlasting life. 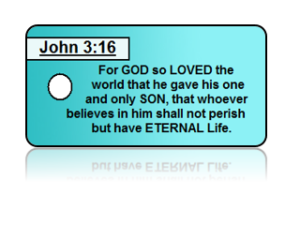 John 3:16 (NKJV) - For God so loved the world that He gave His only begotten Son, that whoever believes in Him should not perish but have everlasting life. EACH Quantity discounts are available, for quantities over 250?Click here for quote. 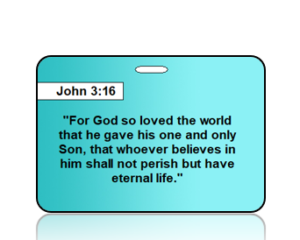 John 3:16 Teal Bag Tag Add your contact information or a checklist to the back of your tags.Size: 3.88" x 2.63" Material: Durable PVC Plastic Features: High Definition Print Pre-punched HoleEach Bag Tag includes (1) Luggage Loop! ?Not exactly what you were looking for? Click Create Design! 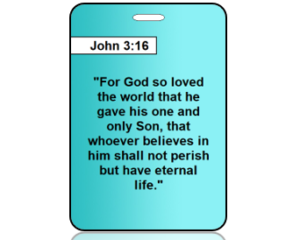 EACHJohn 3:16 - "For God so loved the world that he gave his one and only Son, that whoever believes in him shall not perish but have eternal life." Quantity discounts are available, for quantities over 250 Click here for quote. Add your contact information or a checklist to the back of your tags.Size: 3.88" x 2.63" Material: Durable PVC Plastic Features: High Definition Print Pre-punched HoleEach Bag Tag includes (1) Luggage Loop!Not exactly what you were looking for? Click Create Design! 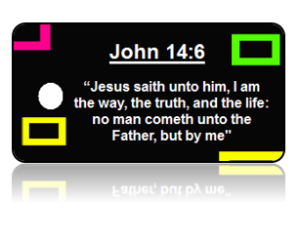 John 14:6 (KJV) - Jesus saith unto him, "I am the way, the truth, and the life: no man cometh unto the Father, but by me." 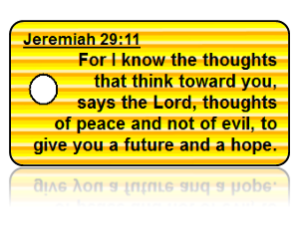 Jeremiah 29:11 (KJV) - For I know the thoughts that think toward you, says the LORD, thoughts of peace, and not of evil, to give you a future and a hope. Isaiah 41:10 (NIV) - So do not fear, for I am with you; be not dismayed, for I am your God; I will strengthen you and help you, I will uphold you with my righteous right hand. 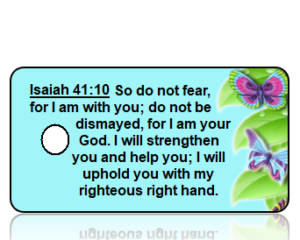 Isaiah 41:10 (ESV) - Fear not, for I am with you; be not dismayed, for I am your God; I will strengthen you, I will help you, I will uphold you with my righteous right hand. 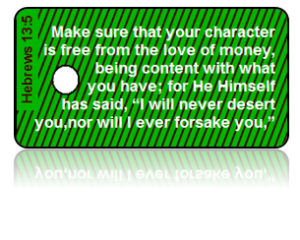 Hebrews 13:5 (NAS) - Make sure that your character is free from the love of money, being content with what you have; for He Himself has said, "I will desert you, nor will I ever forsake you." 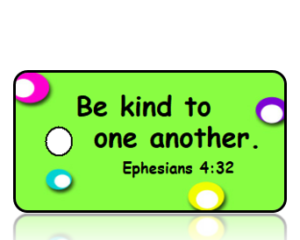 Ephesians 4:32 (ESV) - Be kind to one another. 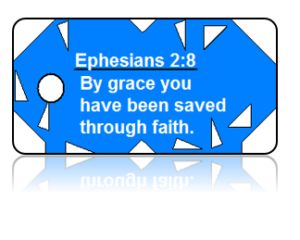 Ephesians 2:8 (ESV) - By grace you have been saved through faith. 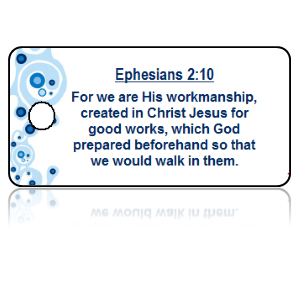 Ephesians 2:10 (NAS) - For we are His workmanship, created in Christ Jesus for good works, which God prepared beforehand so that we would walk in them.